We've seen the DMCA takedown process abused to stifle criticism or remove unflattering content from the web. Knowing that, the first reaction to reading about a website being forced to remove a product review after being hit by a DMCA notice is to assume some overzealous representative of the affected company is simply using copyright's powers for evil. 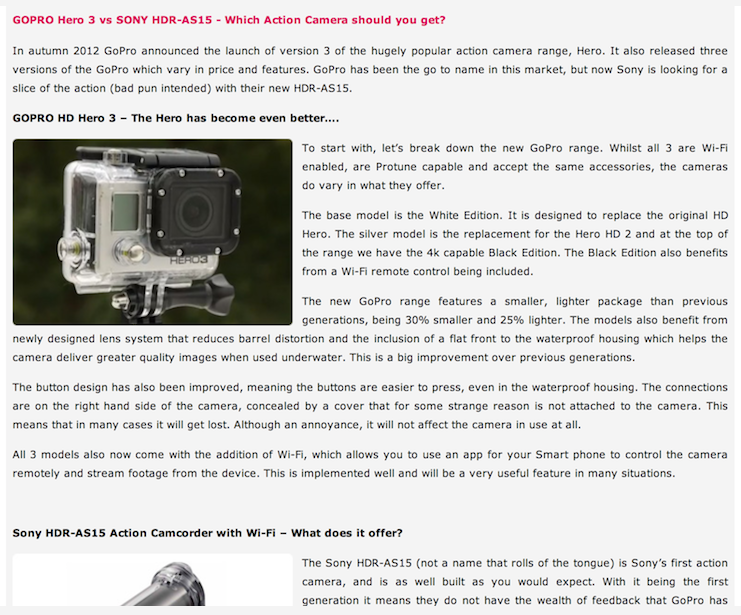 DigitalRev recently posted a review comparing GoPro's Hero 3 camera with Sony's HDR-AS15. Not long after that, a DMCA notice arrived from GoPro (or rather, its "brand representative"), demanding that the review be taken down. So far, so censorious. But the DMCA notice sent didn't describe any sort of copyright violation. Instead, it headed off into a completely different IP area. We are providing you this letter of notification pursuant to the Digital Millennium Copyright Act 17 USC? ?512(c) to make Softlayer.com aware of material on its network or system that infringes the exclusive copyrights of Woodman Labs, Inc d/b/a GoPro (“Company”). We hereby affirm that the undersigned is authorized to act on behalf of Company whose exclusive intellectual property rights we believe to be infringed as described herein. Barring the extraneous question marks, this all looks perfectly normal. But the next paragraph reroutes the entire DMCA. At this point, the notice's issuer, Patrick Hayes (Brand Manager for Woodman Labs), is in uncharted territory. The Digital Millennium Copyright Act notice is for copyright violations only, as can readily be determined by name of the notice itself. Hayes reasserts his trademark violation claim a few paragraphs later, along with a sentence that briefly raises copyright again before returning to the misguided effort at hand. As you may know, if this information is not removed after notice that complies with the DMCA, the Internet Service Provider may also be held liable for the copyright infringement. I have a good faith belief that use of the trademark(s) described above in connection with the domain and URLs described above is not authorized by the trademark owner, and such use is not otherwise permissible under applicable law. I represent that the information in this notification is true and correct and that I am authorized to act on behalf of the trademark owner. Hayes really shouldn't be "representing" that any of this bizarre IP melange is "true and correct." Most of it isn't, starting with using a copyright-only takedown form to shutter a review over alleged trademark infringement. Then there's this: the trademarks mentioned are character marks for the name of the product itself -- "GoPro Hero" -- suggesting that DigitalRev is not allowed to use the name of the product when reviewing the product. This is not how trademark law works. At all. Hang on, though. It gets a bit weirder from there. As I mentioned earlier, the first reaction is that GoPro doesn't like DigitalRev's review and wants it removed before many more people can read it. (That was DigitalRev's first instinct as well, as detailed in its follow-up post on the subject.) Fortunately, DigitalRev screencapped the relevant part of the review. There's nothing in that review that looks like it should trouble GoPro enough to overreact in this fashion. In fact, commenters on the site point out that DigitalRev's reviews of GoPro products usually range from "positive" to "overenthusiastic." So, if the review isn't the issue, what is? Thanks for the heads up on this issue. The letter that was posted next to the review on DigitalRev was not sent in response to the review. Obviously, we welcome editorial reviews of our products. This letter was sent because DigitalRev is not an authorized reseller of GoPro products and they were using images and had incorrect branding and representation of our product in their online commerce store. As part of our program – we ask merchants who are selling our product to use authorized images. That is why DigitalRev was contacted. But – our letter did not clearly communicate this and that is something we will correct. There are a few things that are muddling this situation at the moment. The notice was sent to digitalrev.com not because of the review, but because digitalreview.com is not an authorized reseller and are using our trademark and product images inappropriately. The notice is in regards to the sidebar, not the review itself, but we can see why it seemed like it as the url links to both. We would never attempt to restrict anyone's freedom to share their opinion about us or our products, positive or negative. Even if this rep is correct and Woodman Labs meant to target improper use of its trademarks, it missed with both the delivery system and the URL specified. A DMCA notice can't stop trademark infringement. Furthermore, while a hosting company can be held liable for contributory trademark infringement, it's usually a result of the host mishandling takedown notices (and some conflation of copyright and trademark by the presiding judge), rather than a foregone conclusion. Then again, if you want to hold a service provider liable for this sort of infringement, it helps to use the standard process -- directly contacting the site owner and asking him or her to remove the infringing items. Using a DMCA notice for alleged trademark infringement is just plain wrong, although various GoPro reps' insistence that the trademark infringement includes "images" most likely explains the existence of this half-copyright, half-trademark aberration. However, the most probable explanation for this IP circus is probably contained in this blog post from last November, which details the author's brief altercation with Patrick Hayes and Woodman Labs over a parked domain containing the word "gopro." The letter he received accused him of "domain infringement," and while the tone of the letter was generally cordial, Patrick Hayes made the assumption that any registration of the term "gopro" could only be related to Woodman Labs' products. GoPro does not authorize any of its resellers (or anyone else) to use “GoPro” or “HERO” in domain names. Your registration of goprodivemaster.com is unfortunately in direct violation of this policy. We understand that your intention is simply to sell and promote our products, but GoPro cannot risk misleading customers into believing that they are interacting directly with GoPro when they are engaging with your website or your organization. The use of our trademark terms in your business name may cause confusion, and is prohibited under international trademark law. Even if the domain redirects to another site, this is not a permissible use of our brand terms. Please understand: GoPro has spent years building its brand name—only the company itself is legally represented as “GoPro” or the manufacturer of the “HERO” line of cameras. We need you to kindly discontinue the use of our registered/trademarked name as soon as possible. The author points out that his parked domain had nothing to do with GoPro or its cameras. He also points out that this issue will certainly surface again, considering the Professional Association of Underwater Instructors uses the term quite often in relation to its instructor development centers. Additionally, he did a little detective work and checked out the WHOIS information on the email address and found the domain was associated with MarkMonitor. So, it appears GoPro is outsourcing its IP protection to a company that seems to take a pray-and-spray approach to takedown notices. Quite possibly it takes little more than having the word "gopro" appear in a URL (like the review above) to summon the bot-fury of MarkMonitor and Patrick Hayes, "Brand Manager." This explains the bizarre trademark claims and the incomprehensible takedown of a positive review. If this is indeed the case, GoPro is probably considering taking the job back in-house, seeing as its reputation is being damaged further with each retelling of this unfortunate saga. UPDATE: GoPro's Twitter account claims that five other URLs were included in the takedown notice, but were scrubbed by DigitalRev prior to publishing. However, it has not posted the unedited version for verification. Gosh, it's the old one "botched" anomaly means "do away with all copyright" theme! You guys must have this on a schedule and shoehorn some text in when the time comes. -- Well, I suspect this was pushed out quick to distract from the just prior IsoHunt loss. Re: Gosh, it's the old one "botched" anomaly means "do away with all copyright" theme! "do away with all copyright"
Where did you read that? Oh right you comment on the stories, not read them. Have you looked up the definition of 'anomaly' recently? The angular distance of a planet or satellite from its last perihelion or perigee. Since these posts seem to be a daily occurrence around here maybe they are a bit more than 'just an anomaly'. "You guys must have this on a schedule and shoehorn some text in when the time comes." OttB must have this on a schedule and shoehorn some text in when the time comes. Since this is news that just happened, not something that Mike 'sat on' for a while, you are just blowing out of your arse as usual. Seriously, how do you get from "conflating copyright and trademarks" to "do away with all copyright"? Can you even do reading comprehension? Looks like *you* are the one who shoehorns your agenda into every post, only with less evidence. and they were using images and had incorrect branding and representation of our product in their online commerce store. As part of our program � we ask merchants who are selling our product to use authorized images. Using a hammer to crack a nut, unless they are claiming the images used were their copyright. The implication is that they were not, as they were not the 'authorised images'. That should not be reason for a DMCA notice, but rather a polite note to request correction. People should check out the 108 one star reviews for the new GoPro Hero Black Edition. The Camera has gotten five star reviews on Gadget sites because of its small size and amazing specs. But many, many actual users say that the specs don't mean a thing when the Hero 3s are constantly crashing. If there is one thing your action camera needs to be it's reliable, because you only have one chance to record that footage. Reviewers claim that GoPro is knowingly sending out defective cameras. So defective that many people say they destroy expensive 64GB micro SD cards. R eviewers allege that the people who give the camera good reviews haven't used it enough and that the errors are cumulative, and build up due to software errors over time. When you get a $400 GoPro Hero 3 Black Edition camera the first thing you have to do to use them is a mandatory update the to firmware, the shipping firmware apparently being defective out the door. "We tried to post this same review (but 3 stars and minus the go-pro being a bad company part) but they have refused to post it! We did not violate any of the rules they have when posting a review on their website. The review was rejected because of the simple fact that it was a 3 star review of their product..."
A look at the GoPro website shows that there are, in fact, negative reviews of the GoPro Hero 3 black. However, they don't have any where near as many as on the Amazon website, so it is possible that some negative reviews are not making it on to the GoPro site. And where have we recently heard the name of MarkMonitor at? Could it be in relation to the owner of Dtecnet, you know the one they are depending on giving accurate accusations for the 6 strikes. This is the second time items like this has come up reflecting the poor identifying of copyright infringement articles, neither of which have hit the nail on the head and does not bode well for the supposed function it will have in 6 strikes. Normally you would have thought that a company with such a horrible success or functioning rate would be ruined. As happens for the real business world. You forgot about the FUD factor they use in marketing their services and also bribery works too. Here I thought there was an actual penalty spelled out in the DMCA for an egregiously incorrect takedown notice. Seems to be the one provision in the DMCA that is not enforced. So we have a strange copyright dispute because they were not using "authorised" images (there are no such thing) instead using ones they themselves had taken so the copyright is actually owned by DigitalRev no matter what. The sense of entitlement is disgusting. In the end it's just means to stifle opinions they didn't authorize. I think it's amazing that you can find lawyers who will issue copyright infringement letters knowing that what they are writing has nothing to do with actual laws. Depression - Be careful here, don't just throw your hands up in the air and say "Everyone on the whole entire internet thinks I'm a copyright troll, I'll show them copyright troll, GRRRR!" very informative article, appreciate the info and thanks for sharing. When it comes to lawyers and copyright its an expensive road to travel down, my thoughts go out to those involved. I think the digital camera review worked perfectly. I came to know many facts behind this and also about the copyrights. Thanks for all those links provided above which gave me an idea about it. I simply loved this camera pal. Good share keep doing more. Glad I picked up on this article. Surely now I know what to do and not to do when reviewing future trail cameras. Not a path I would like to go into.